Avatar therapy allows patients to choose a digital face (or "avatar") that best resembles what they picture their phantom voice to look like. Then, after discussing ahead of time the things the voice often says to the patient, a therapist sits in a separate room and "talks" through the animated avatar shown on a computer monitor in a disguised and filtered voice as it interacts with the patient. "Opening up a dialogue between a patient and the voice they've been hearing is powerful. This is a way to talk to it instead of only hearing 1-way conversations," lead author and creator of the therapy program Julian Leff, MD, FRCPsych, emeritus professor at the Institute of Psychiatry in London, told meeting attendees. "As the therapist, I'm sharing the patient's experience and can actually hear what the patient hears. But it's important to remind them that this is something that they created and that they are in a safe space," Dr. Leff told Medscape Medical News after his presentation. Dr. Leff explained that this program started a little more than 3 years ago, after he had retired "and could start thinking clearly again." He had been interested in the phenomenon of phantom voices for more than 40 years. "Our mind craves meaningful input. That's its nourishment. And if it's deprived of nourishment, it pushes out something into the outside world," he said. "The aim of our therapy is to give the patient's ego back its mastery over lost provinces of his mental life." The researchers used the "off-shelf programs" Facegen for the creation of the avatar faces and Annosoft LIP-SYNC for animating the lips and mouth. They also used a novel real-time voice-morphing program for the voice matching and to let the voice of a therapist to be changed. Another patient chose a "red devil" avatar and a low, booming voice to represent the aggressiveness that he had been hearing for 16 years. "We told them: It's like having a therapist in your pocket. Use it," said Dr. Leff. All of the avatars started out appearing very stern; they talked loudly and said horrible things to match what the patients had been reportedly experiencing. But after patients learned to talk back to the faces in more confident tones, the avatars began to "soften up" and discuss issues rationally and even offer advice. Although 1 female patient reported that her phantom voice had not gone away, it had gotten much quieter. "When we asked her why, she said, 'The voice now knows that if it talks to me, I'll talk back,' " said Dr. Leff. "These people are giving a face to an incredibly destructive force in their mind. Giving them control to create the avatar lets them control the situation and even make friends with it," he added. "The moment that a patient says something and the avatar responds differently than before, everything changes." A bigger study with a proposed sample size of 140 is currently under way and is "about a quarter of the way complete," Dr. Leff reports. Of these patients, 70 will receive avatar therapy, and 70 will receive supportive counseling. "In order for others to master this therapy, it is necessary to construct a treatment manual and this has now been completed, in preparation for the replication study," write the investigators. "One of its main aims is to determine whether clinicians working in a standard setting can be trained to achieve results comparable to those that emerged from the pilot study," they add. "I think this is really exciting. It's a fascinating, new form of therapy," session moderator Sridevi Kalidindi, FRCPsych, consultant psychiatrist and clinical lead in rehabilitation at South London and Maudsley NHS Foundation Trust in the United Kingdom, told Medscape Medical News. "I think it is a novel way of approaching these very challenging symptoms that people have. From the early results that have been presented, it provides hope for people that they may actually be able to improve from all of these symptoms. And we may be able to reduce their distress in quite a different way from anything we've ever done before." She added that she will be watching this ongoing program "with great interest." "I was very enthused to learn that more research is going on with this particularly complex group," said Dr. Kalidindi. "This could be something for people who have perhaps not benefitted from other types of intervention. Overall, it's fantastic." 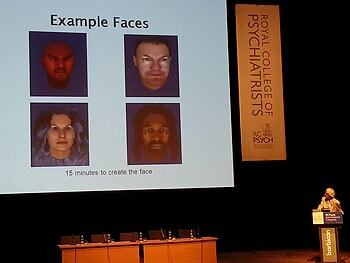 Cite this article: Novel 'Avatar Therapy' May Silence Voices in Schizophrenia. Medscape. Jul 03, 2014. The benefits of routine childhood vaccines outweigh the risks of rare adverse events, according to results of a new systematic review. Although some vaccines are associated with serious adverse events, these events are extremely rare, the authors write. The researchers conducted a literature review of the safety of vaccines routinely recommended for children aged 6 years and younger and found that the strength of evidence is high that the measles, mumps, and rubella vaccine (MMR) is not associated with the onset of autism in children, and MMR; diphtheria, tetanus, acellular pertussis vaccination (DTaP); tetanus-diphtheria (Td); Haemophilus influenza type b (Hib); and hepatitis B vaccines are not associated with childhood leukemia. "Our ﬁndings findings may allay some patient, caregiver, and health care provider concerns," the authors conclude. Margaret A. Maglione, MPP, from RAND Corporation, Santa Monica, California, and colleagues addressed the safety of these vaccines: DTaP, hepatitis A, hepatitis B, Hib, influenza (live attenuated and inactivated), meningococcal (conjugate or polysaccharide), MMR, pneumococcal (conjugate or polysaccharide), rotavirus, and varicella. The results of their review were published online July 1 in Pediatrics. The Agency for Healthcare Research and Quality commissioned the review to identify any gaps in evidence regarding the safety of routinely recommended vaccines. Concerns have led some parents to refuse the vaccines, resulting in the resurgence of diseases such as measles and pertussis. The researchers included 67 studies in the review. Data were drawn from sources including PubMed, Advisory Committee on Immunization Practices statements, package inserts, manufacturer information packets, and the 2011 Institute of Medicine consensus report on vaccine safety. The authors included only studies that used active surveillance and had a control mechanism. In addition, they included studies in which the strength of evidence was rated as high (further research is very unlikely to change conclusions), moderate (further research may change conclusions), low (further research is likely to change conclusions), and insufficient (evidence is unavailable or does not permit conclusions). The strength of evidence was high for a link between MMR and febrile seizures, and the varicella vaccine was associated with complications in immunodeficient individuals. There was moderate evidence that rotavirus vaccines are associated with intussusception, but these instances were all rare. For example, although 1 large US epidemiologic study found no association, a recent analysis of the US Post-Licensure Rapid Immunization Safety Monitoring program found that both RotaTeq(Merck) and Rotarix (GlaxoSmithKline) were associated with intussusception in the short term. Estimated rates were 1.1 to 1.5 cases per 100,000 doses of RotaTeq and 5.1 cases per 100,000 doses of Rotarix. Limitations of the literature review include that the majority of studies did not investigate or identify risk factors for adverse events, and that the severity of adverse events was inconsistently reported, the authors acknowledge. In an accompanying editorial, Carrie Byington, MD, from the Department of Pediatrics, University of Utah, Salt Lake City, said physician confidence is critical in reassuring parents. "Parents trust their child's doctor over government officials, family members, or celebrities as the best source of information on vaccine safety," Dr. Byington writes. "Clinicians can examine the nonbiased data presented in the [Institute of Medicine] report and the report by Maglione et al to increase their own confidence in vaccine safety and their advocacy for vaccines. Ideally, provider confidence in vaccine safety will increase the confidence of the families they serve and increase vaccination rates for children, safeguarding the health of the nation." The review was supported by the Agency for Healthcare Research and Quality, US Department of Health and Human Services. The authors have disclosed no relevant financial relationships. The editorial was supported by the HA and Edna Benning Presidential Endowment; National Center for Advancing Translational Sciences of the National Institutes of Health. Dr. Byington has intellectual property in and receives royalties from BioFire Diagnostics, Inc. Cite this article: Childhood Vaccines: Serious Adverse Events Rare. Medscape. Jul 01, 2014. This year’s Top 40 Largest Assisted Living Companies represent an occupant capacity of more than 214,000. And this year it’s Brentwood, Tenn.-based Brookdale Senior Living taking the top spot with more than 34,513 in occupant capacity. No. 2, Emeritus Senior Living, Seattle, comes in at 31,700. But the numbers drop precipitously after that, with the No. 3, Atria Senior Living Group, registering a capacity of 17,000—half of Brookdale’s count. No. 4 Sunrise Senior Living holds an occupant capacity of 15,220, followed by Five Star Quality Care at just over 14,000. From there the capacities range from 9,000 down to 4,950, at the No. 10 slot. With the announcement in February that Brookdale and Emeritus will merge, next year’s Top 10 assisted living companies will look quite different in terms of capacity. The new Brookdale will become a mammoth provider of assisted living, with an unprecedented capacity that registers north of 64,000, while the remaining nine companies will likely make up a total of approximately 80,000. Dementia care programs continue to dominate the sector, with all 40 of this year’s lineup offering this service, just as they did last year. Independent living units are offered by all but three of this year’s Top 40, up one count from last year, while just over half of the lineup has nursing home care among its business lines, down two from last year. Exactly half of the Top 40 providers count outpatient rehabilitation therapy among their service offerings. Hospice is offered by 19 companies, and dialysis services are provided by seven of this year’s assisted living pack leaders. Bariatric services are offered by 11 of the Top 40 this year, and 14 companies have home care among their business lines. Looking ahead, the leading assisted living companies appear to be strategizing for the impending baby boom onslaught with the addition of more spa-like services and amenities. No. 19, Americare, reports that it eliminated nurse stations and med carts “years ago” and also implemented “natural awakening” programs. The company also has adopted a “May I Take Your Order” dining initiative. Find more details about 2014's Top 50. Communities work to incorporate the latest technology into their increasingly medical model, as REITs direct more attention to the sector. The increasing medical needs of assisted living residents, the growing pressure to incorporate technology into operations brought to bear by more tracking of quality data, the expanding investor interest in assisted living projects—these are some of the dominant trends affecting assisted living directors, administrators, operators, staff, and others involved in the profession, and one overlaps the others. More medical care is generating greater interest from accountable care organizations (ACOs) and regulators, who rely on technology to provide them with the data they need. Families want to be kept in the loop as assisted living staff struggle to navigate a resident’s treatment through the continually larger circle of providers and other parties involved in that care. Investors, including real estate investment trusts (REITs) with their escalating activity, are drawn to assisted living communities and portfolios smiled upon by the powers that be. Provider offers a look at three of today’s biggest assisted living trends: care, technology, and the world of the REITs. These days, assisted living is increasingly about providing quality care beyond the traditional safer living environment it’s offered since its inception, say providers. Physician and Administrator Tim Giancarlo is president and chief executive officer (CEO) of a company founded by his physician father almost 50 years ago: The Allendale Community for Senior Living. The privately owned Allendale Community offers skilled nursing, post-acute care with an extensive rehab program, assisted and independent living, dementia care, and day care spread across 12 acres. The community features waterfalls and fountains in the suburban Allendale, N.J., community 25 minutes away from New York City. Giancarlo was literally raised to become who he is today. Many of his earliest memories are of The Allendale Community; his parents began bringing him there to be part of the community’s life from the time he was a baby. Assisted living providers are increasingly called upon to provide higher and more complex levels of medical care, says Giancarlo, and providers are responding with an astonishing array of care and therapy offerings. “Caregiving is going in all kinds of directions in assisted living,” says Giancarlo. “There’s assisted living for people who are still somewhat independent, and assisted living for people suffering from dementia, and everything in between. The Allendale Community’s assisted living residence, like many assisted living providers, has turned to hiring staff with higher levels of clinical training. “We’re bringing in more trained personnel,” he says. “We’re going with an all-LPN [licensed practical nurse] staff in our assisted living [residence],” and he says other assisted living providers are making similar decisions. Just managing the greater complexity of residents’ medication regimens makes the change necessary. In fact, underneath the glamorous environment, private rooms, and astonishing array of activities and social opportunities at the assisted living residence, “we are pretty much running it like a nursing home” of years past, he says. Along with physical, occupational, and speech therapy, many of Allendale’s activities serve a therapeutic purpose: the Zumba, tai chi, and karate classes, for example, or aroma and music therapies, along with a host of other wellness activities. “With the increase in [the national population’s] age, you’re seeing a rise in elderly people with cognitive issues,” says Giancarlo. “Dementia’s becoming a big sector in this industry. People are living from 90 to 100 years and are walking around healthy from the neck down, but cognitively [compromised].” Because of this, The Allendale Community provides cognitive therapies, such as its recently implemented Brain HQ program, which has been recognized by the state’s Department of Health. Because assisted living residents “are getting hipper,” says Giancarlo, the residence features an Internet café, game room with free video games and WiFi, 24-hour theater, 24-hour diner with free coffee and snacks, putting green, bridge room, and miniature golf, as well as a daily 5 p.m. “happy hour” with live entertainment, followed by the cocktail “hour” that runs from 6 p.m. to 8:30. Oh, and of course, a library, billiards room, and, naturally, shuffleboard. Cultural offerings include concerts featuring classical music or show tunes (as well as the live music the community offers daily), poetry readings, plays, and day-long celebrations of Shakespeare or opera. Educational opportunities are offered not only for residents but the surrounding community, such as the forums on such topics as elder law, finance, or health-related issues, as well as lectures on a wide array of subjects. Good old family-inclusive events abound, such as the annual strawberry festival and the heritage-based festivals like the community’s Filipino Festival. Time-honored activities are also abundant, such as the quilting circle, gala events such as the recent Evening in Paris, no-holds-barred birthday bashes, spiritual activities, and field trips to nearby cultural sites like the aviation museum. “There’s always something going on,” says Giancarlo. “As long as you keep [residents] youthful, I think you will keep them living longer,” while leading more fulfilling lives. The Allendale Community’s assisted living residence is an “Advanced Standing” facility, which means that it has been singled out by the state’s Department of Health as providing outstanding care. Achieving that status wasn’t cheap, says Giancarlo, but it was an important goal to him and his staff. Although turnover is a big issue for many assisted living facilities, The Allendale Community was ahead of the game on that one. “We don’t have a lot of turnover,” he says. “We try to keep the staff happy; happy staff members provide higher-quality care.” Keeping turnover low is also important to Giancarlo because he wants residents and families to see familiar faces providing their care. For Todd Stivland, MD, owner and CEO of Bluestone Solutions and provider of onsite medical care for assisted living facility (ALF) residents, technology has become pretty much a way of life. A family physician for 19 years, Stivland oversaw clinical tool development and implementation of a Duluth clinic’s electronic health records, directed the creation of custom software for onsite care models, and serves on Minnesota state policy committees. In 2012, Stivland founded Bluestone, now the largest provider of onsite coordinated care and advanced care coordination for complex patients in Minnesota. That’s true of health care in general, and in keeping with the whole health care sector, assisted living is seeing “a boom in technology,” Stivland says. One of the biggest issues in health care—one that technology has the power to solve—is the difficulty in coordinating care, Stivland says. It was such a problem, in fact, that Stivland created technology that reconciles all of these different data sources on its varying computer systems and streamlines the process of providing the data to all the parties involved. “All of the faxes and phone calls were killing us—they’re so inefficient and time consuming,” he says. “We’ve created a system where anybody involved in the care system can communicate with each other.” The system handles everything from patient monitoring to getting prescriptions filled and follow-up arranged. “For instance, say the nurse at the ALF goes to see a resident and finds he has a bladder infection,” says Stivland. “She would send the information to us—the symptoms and that she wants a urine test.” The Bluestone doctor receives the information on a smart phone that’s kept near at all times; reviews the information; and, if a test is warranted, sends an electronic order to the lab. being treated, and asks if they have any questions. If they do, the doctors at Bluestone answer them. Bluestone now provides easily accessed physician services to 4,000 patients, 180 ALFs, and more than 100 home care agencies. Even without any marketing, Bluestone has sold the system to four other local practices, and others are considering a purchase. The system was developed over eight years in close consultation with technology companies that make assisted living-specific software. The effort required a $2 million investment. The needs of the elderly are inspiring more than just Stivland. The first Aging 2.0 Global Innovation Summit was held in San Francisco in mid-May and brought a select group of technology innovators together with investors and seniors housing providers. The Aging 2.0 summit was organized by Generator Ventures, founded by Katy Fike, a 35-year-old gerontologist and former investment banker, and Stephen Johnston, a 2002 Harvard Business School graduate. Generator Ventures’ other program, called Aging 2.0 Generator, takes a few hand-picked technology innovators and works with them for six months to help them develop their ideas into companies with marketable products. The six-month effort is housed in a senior center—the Bay Area nonprofit Institute on Aging, which provides services for thousands of seniors every year. That gives innovators unique research opportunities as they develop their products. The Generator program also provides customized curriculum designed and delivered by industry leaders and facilitates the innovators connecting with investors, distributors, senior care providers, and press. The program culminated with the Aging 2.0 summit, which was also attended by 30 new innovators hoping to get into the next Generator program. ■ Pixie Scientific. Pixie is developing patches that can be put on the outside of a senior’s diaper. When the diaper is soiled and removed, the caregiver can scan the patch and upload information about the senior’s health condition, such as indicators that a urinary tract infection is developing or the senior is dehydrated. ■ Life2. This company is developing a database and program based on predictive analytics that aim to predict which residents are likely to develop specific health issues, such as pulmonary problems. The information would alert staff to keep an eye out for a list of early warning signs and tell them why the resident is at heightened risk. The program would also provide information on what can be done to mitigate the risk. ■ Jibo. This company hired a Massachusetts Institute of Technology professor to help develop “emotional robotics.” The goal is to develop a robot that a senior can interact with and that will appear to respond with human-like emotions to the senior. The robot would act both as a companion (assisting with crossword puzzles, for example, or helping the senior use the Internet to connect with family members) as well as an entity that provides services like medication reminders and diet and exercise monitoring. The idea is to provide this technology for about the cost of a laptop computer. ■ Lift Hero. This is a service that allows seniors to request a ride via the Internet or phone. Drivers, who are prescreened, off-duty EMTs and other medical professionals, pick up the seniors, drive them to their locations, assist them inside, and then return them to their homes and help them get situated there again. Rides can be ordered when needed or be pre-booked. Standing arrangements may also be made. ■ Lively. This is a system of activity sensors that wirelessly transmit information about a senior’s activities to a Web-based app that a family member can check regularly to make sure the senior is up and about and engaging in his or her routine activities. Stanford University, in collaboration with Aging 2.0, issued a design challenge from its Stanford Center on Longevity last year with the goal of identifying students around the world with great technology-based ideas useful to seniors, and to help students refine those ideas. Among the finalists was Ritika Mathur from the Copenhagen Institute of Design. Mathur’s idea, called Memory Maps, would combine a device with a radio frequency identification reader with a map of the senior’s neighborhood and global positioning satellite technology. The device would be used by someone with early-stage dementia or other cognitive problems. It would allow the senior and his or her family to actually record memories associated with the map and “pin” them to map locations. Another finalist was Huabin Kok from Singapore National University whose idea is called Taste+. This is a spoon with electrical stimulation that would be used by someone whose taste sensations have been diminished (common with dementia). By tapping a button on the spoon, the device provides a simulated salty or sour flavor when the user puts the spoon (and the food on it) into his or her mouth. REITs have been significantly expanding their portfolios this year, investing considerable money in assisted living, say industry watchers. REITs can offer seniors housing providers a cost-effective monetization option, making capital available to help them take advantage of growth opportunities or build a hedge against risk. And although in the past REITs were reluctant to be involved in new construction or turnarounds, their greater access to capital has made them more flexible in this regard, especially when it comes to seniors housing companies they’ve partnered with successfully in the past. The fragmented, $2 trillion health care real estate market is benefiting from competitive capital costs and demographic trends, among other factors. Investor interest will continue to grow, extending the seniors housing recovery into next year, according to Beth Mace, chief economist at the National Investment Center for the Seniors Housing and Care Industry, Annapolis, Md. There are several reasons for her optimism, including improvements in the volume and prices of home sales, stock market performance, and consumer confidence and income. And as the number of people over age 80 grows through the next decades, the number of middle-aged family caregivers will shrink, according to a recent AARP study. Today, the ratio of caregivers aged 45 to 64 to people over age 80 is 7:1, the study showed. That ratio will drop to 4:1 in 2030 and to less than 3:1 in 2050, the study found—a decrease due not only to the aging of the baby boomer generation but also to younger women having had fewer children. Ventas, a Chicago-based REIT, is already one of the largest health care REITs in the country, and it will soon be easily the biggest if its plan to acquire competitor American Realty Capital Healthcare Trust (ARCHT) is approved by ARCHT shareholders. The offer was announced in early June. Ventas has now purchased at least three health care REITs, according to The Seniorcare Investor, published by Levin Associates, based in Norwalk, Conn., and the publication’s editors expect Ventas won’t stop there. The unsolicited $2.6 billion deal has been approved by both boards of directors and is expected to close in the fourth quarter. The announcement caused ARCHT’s stock price to rise by 11.1 percent, while Ventas’ dropped by 2.2 percent. Ventas also plans to acquire 29 Canadian independent living communities from Holiday Retirement in a $900 million transaction expected to close in the third quarter. The properties will be managed by its portfolio company, Atria Senior Living. Ventas is recording notable gains in its funds from operations, Cafaro said at the investor forum, arising from productive assets, refinancing at lower interest rates, and the company’s development and redevelopment efforts. Another of the largest health care REITs, Health Care REIT (HCR) based in Toledo, Ohio, also made a significant move in June, completing a $1 billion public offering. HCR plans to use some of the money to increase its investment in seniors housing and other health care properties. During the previous month, the REIT sold 14 million shares at $62.35 per share and announced that it has signed preliminary agreements to acquire $414 million of seniors housing and medical office properties during the second quarter. HCR also announced in May the purchase of a 46.8 percent interest in a 10-property Senior Resource Group package. Those properties are in California, Arizona, and Oregon. In April, Irvine, Calif.-based HCP announced a $1.2 billion entry-fee continuing care retirement community (CCRC) joint venture with Brookdale Senior Living. The 49 percent ownership would give HCP the largest CCRC package of any health care REIT in the country. Griffin-American Healthcare REIT, a public, nonlisted company that claims 73 acquisitions comprising 286 buildings, has an approach President and Chief Operating Officer Dan Prosky describes as “rifle shot”—as opposed to the larger REITs’ “shotgun”—approach to acquisitions. Last year, Griffin-American completed $1.5 billion in small acquisitions. Nontraded REITs like Griffin-American have been very successful with raising capital and, therefore, are aggressive purchasers of property, according to analysts. For example, Griffin-American has raised almost $3 billion in the past four years, and its investments haven’t stayed solely in the United States. Griffin-American acquired a $472 million seniors housing portfolio from London-based Caring Homes Health Care Group last year. Prosky doesn’t anticipate as much activity this year, but cites the company’s lack of debt and high percentage of mortgage-free properties as conducive to further acquisitions and development. Industry watchers were anticipating the acquisition of Griffin-American itself. A Wall Street Journal story in May listed four companies vying for Griffin-American and predicted a price tag in the $3.7 billion range. Some analysts saw ARCHT as the front-runner, with Ventas close behind. But now that Ventas has announced its plan to purchase ARCHT, guessing is the name of the game again. Nontraded REITs aren’t the only active players in the mid-range, though. Chicago-based Aviv REIT, which is public, has announced a new $600 million credit facility that can be expanded to $800 million. Analysts are predicting the company will use the money for acquisitions. The smaller health care REITs are also quite active, although less likely to purchase whole portfolios of properties. ■ Sabra Health Care REIT, Irvine, Calif. Sabra sold 7 million shares at $28.35 per share earlier this year. The company plans to invest between $350 million and $450 million this year, according to Chairman and CEO Rick Matros. ■ CNL Health Care Properties, Orlando, Fla. CNL’s credit facility, increased in May from $120 million to $275 million, will likely result in portfolio growth, especially since the line of credit has the option of being expanded to $325 million. ■ National Health Investors, Murfreesboro, Tenn. NHI acquired an assisted living community for $11.5 million in April, but its long-range goals don’t include growing itself into a large REIT, according to President and CEO Justin Hutchens; rather, NHI takes pride in its attention to prized, quality customers. ■ CareTrust REIT, Mission Viejo, Calif. As of June 2, a new health care REIT has entered the field: CareTrust REIT. CareTrust is a spin-off of The Ensign Group and owns substantially all of Ensign’s properties. CareTrust is now trading on the NASDAQ. Global Select Market. The Ensign Group is now the operating company.